Another Monday, another snowfall during the commute. Another Monday, another snowfall during the commute. (Hopefully this isn’t the trend for the year – Mondays are difficult enough, right?) This will be a more significant storm than last week's. We are expecting to see an initial burst of snow during the evening. A quick 1” -2” of snow is likely, and that will be it for the coast. Snow will change to rain before sunrise for most coastal communities, but travel will still be tough – melting snow, slush and some heavy rain. If mass-transit is an option – take it. North of Massachusetts we will see the snow continue. Parts of New Hampshire will see double digit totals, especially north of exit 25 on interstate 93. This will be the jackpot area in the northeast. Considering Christmas week is the busiest week of the year at ski resorts – this is excellent news. Overshadowing this early week storm is the bitter (possibly dangerous) cold moving in at the end of the week. Wind chills may drop to -25° in Boston by Friday morning. The air temperature won’t climb out of the teens. 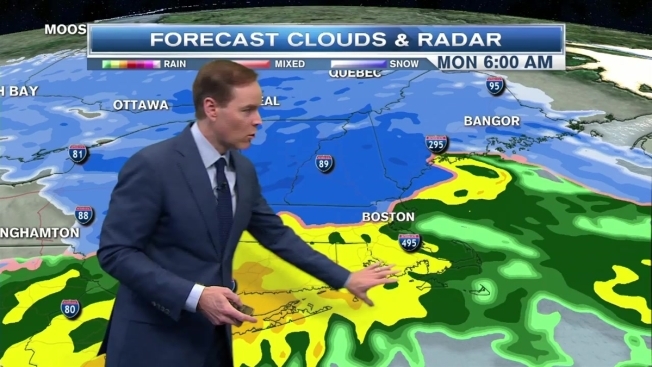 Snow showers are possible and with such a “fluff factor” – an inch of powder is possible. Winds will also be howling and could be strong enough to cause some isolated power outages. A storm moves in for next weekend with snow changing to rain. The potential is there for damaging wind gusts. Our most recent forecast models have been hinting at this possibility. If these trends continue, make sure your generator is in working order.